120 min. Sony Pictures Classics. Director: Jeff Nichols. Cast: Michael Shannon, Jessica Chastain, Shea Whigham, Katy Mixon, Kathy Baker. The Biblical notion of signs and wonders gets a workout in Jeff Nichols’ Take Shelter. It’s no accident that the folks at the center of the film—father, mother, and deaf six-year-old daughter—frequently talk to each other in sign language, and the father turns out to be something of a Noah figure, interpreting visions and dreams as signs of a coming calamity. Storm clouds begin to gather in the film’s first scene, as small-town-Ohio construction worker Curtis LaForche (Michael Shannon) looks heavenward and doesn’t like what he sees. Scarily realistic dreams of twisters and a wild dog’s bite, brown rain, and odd-flocking birds unnerve Curtis enough to send him down a path of determined survivalism on behalf of his family. Taking out a “risky loan” and crossing ethical lines in the workplace and his personal relationships, Curtis buys a shipping container, stocks up on canned goods, and sets to work converting his storm cellar into a shelter to withstand the worst-case scenario. At least at the outset, Curtis retains enough reason to hesitate. Primarily, his self-doubt involves a family history of mental illness (as Curtis’ schizophrenic mom, Kathy Baker turns in a performance of career-best subtlety), and he struggles with fear and shame that understandably but mistakenly prevent him from confiding in his wife (Jessica Chastain, maintaining her stellar breakout year). In some ways, Take Shelter is a psychological horror film, an ambiguous mood piece that flirts with entering Donnie Darko territory. It’s also a compassionate and respectful drama about the grey areas of slow-encroaching mental illness. But writer-director Nichols, who first teamed with Shannon on the similarly affecting Shotgun Stories, has the even greater ambition to fashion a Rod Serling-esque social allegory for these days of economic collapse, environmental sea change, and increasing talk of “end times.” Any way Nichols slices it, Take Shelter cuts deep, proving equally capable of excruciating tension and aching empathy. The story of a Middle American family trying to survive, trying to make impossible choices (deciding whether trusting oneself or not is the mistake), in the most trying of times clearly speaks to the moment. Early on, when his best friend comments, “You’ve got a good life,” Curtis replies, “It ain’t always so easy.” But when real strife arrives, it’s a lesson not to take the good life for granted. Even those who find the film’s deliberate pace off-putting will have to concede that Shannon’s work is superlative, whether in moments of quiet but tortured confusion and stress, or in an inevitable public breakdown, scaled perfectly to life size. Nichols doesn’t miss any opportunity for irony (a counselor who blithely and unhelpfully remarks, “It’s been kind of crazy around here lately”), and his ambiguous ending doesn’t cop out, but rather allows the audience to make their own meaning from Curtis’ journey. 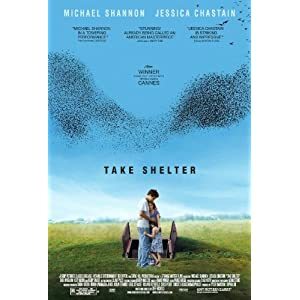 Film fans can be grateful that Sony ponied up for a Blu-ray release of Take Shelter, one of the best films of 2011. The near-perfect hi-def transfer ideally recreates the source material, with crisp detail, fine texture, and true color. Inky black level and ideal contrast help to make the experience as vivid and dimensional as possible; only a few white specks (presumably in the source photography or final master) distract a tad. The lossless DTS-HD Master Audio 5.1 is even more crucial to the film's effect, with its insinuating and creepy sound design. Every creak and breath and whistle comes through with precision clarity and placement in the sound field. It's another technically brilliant release from Sony. The disc also includes some terrific bonus features, beginning with an audio commentary with director Jeff Nichols and Michael Shannon. The two-time collaborators discuss their process and their thoughts about the film, including some character secrets and anecdotes from the shoot. "Behind the Scenes of Take Shelter" (10:34, HD) doesn't go into any useful depth, but it does provide a few interview clips of Nichols, Shannon, Jessica Chastain, and others. "Q&A with Michael Shannon and Shea Whigham" (19:50, HD) is much better, providing access to a SAG Foundation Q&A with Shannon and his co-star. Two "Deleted Scenes" (5:57, HD) include "Second Counselor Session" and "Picnic Table," and we also get the film's "Theatrical Trailer" (2:11, HD). All site content © 2000-2019 Peter Canavese. Page generated at 04/18/2019 06:01:36AM.